From the Docs tab, you can toggle Docs search on or off. When Docs is disabled, customers are presented with a contact form to get in touch. When Docs is enabled, they can search your knowledge base before sending a message. From the Docs Site dropdown, pick which site you want to link to the Beacon. You can chose to display all Docs content, or only allow customers to search for articles in specific collections. If you do not have Docs installed, the Enable Docs toggle is disabled. Note: You can only link a single Docs site to a single Beacon. 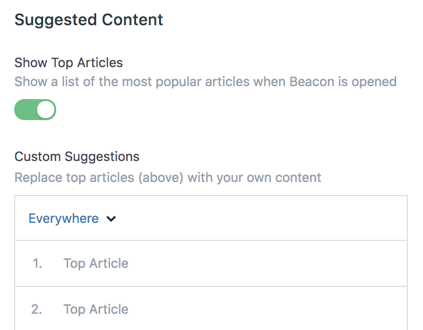 Suggested content lets you surface specific articles to customers as soon as they open Beacon. For example, if your Beacon is on a pricing page, you might want to show pricing specific help articles right away. You’ll see suggested articles on the Beacon welcome screen. By default, we’ll show a list of the most popular Docs articles when Beacon is opened. You can use Custom Suggestions to override this list, and unlock the ability to disable top articles. You can add custom web links or specific Docs articles to show in Beacon based on the page the customer is looking at. 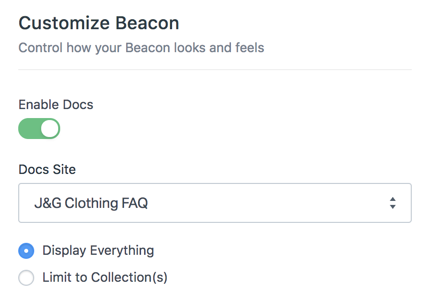 Note: Looking to add your Beacon to an existing Help Scout hosted Docs site? Grab your Beacon code from the Installation tab, then paste that into the "Insert Head Code" field under Manage > Docs > Custom Code. Press Save and you're all set!